This article contains the stats, strategy, and guide for Rider - Francis Drake. We will update this as soon as the game comes out. Francis Drake, a famous pirate of England, opened the routes to the Age of Discovery to England. In Fate Grand Order, she is a Rider class servant. Has access to Golden Rule and Pioneer of the Stars which make her excellent in garnering NP gains. Apart from that Voyager of the Sea makes her adaptable to almost any team as it gives additional NP damage for the party. Francis Drake’s class is known for generating high C. Star absorption. In conjunction with Pioneer of the Stars and her NP, she can be suitable for Quick Teams. One drawback however is that her card composition only consists of 1 Quick Card, which makes it difficult to chain for Quick effectiveness. Be sure to gather as much C. Stars as you can to capitalize on Critical Damage since she suffers from missing Critical Strength oriented skills. Focus on enhancing Voyager of the Sea to shorten Cooldown. In effect it will also significantly improve NP damage and Attack. In terms of compatible servants to pair, Edward Teach is worth mentioning because of his Skill which has a boosted effect on women servants. He also has Voyager of the Sea which is appreciated when unleashing NP. Hans Christian Andersen offers buffs support in the form of spreading heals, chance buffs, and critical strength increase. 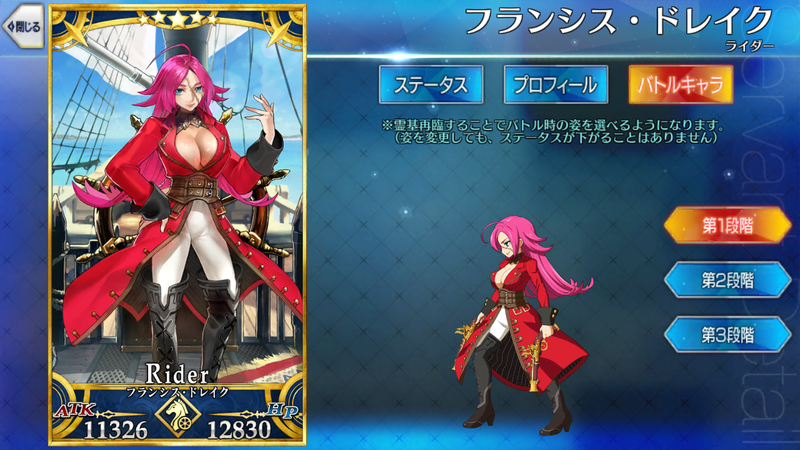 Since Francis Drake is a rider class, she can absorb most of the C. Stars and deal high offensive damage. One downside to this however is that as a support, his damage output is terrible even during chains. Altera‘s also a good partner with Francis Drake. Unleash her Tactics while Francis Drake brings out Voyager of the Sea to increase the party’s over-all NP damage up by 2 levels. Since her active Skills amplify NP gain, it is best to attach a Craft Essence to improve damage. Initially, Heaven’s Feel grants additional 40% damage in addition to its Attack boost. If you cannot afford to consume a high Cost CE, Dragonkin is a decent alternative that grants 15% boost in NP damage. Another low cost CE is Dragon’s Meridian, which gives 30% Starting NP at a moderate cost. Halloween Princess is a decent Craft Essence which increases the power of her Golden Wild Hunt. It also gives her an easier time to work with Pioneer of the Stars which increases her NP gauge. Starting gauge is at 30% with an additional 15% boost in NP strength. Divine Banquet would allow her to gain more NP especially if paired with Golden Rule. Kaleidoscope is always a good NP Craft Essence. A more unorthodox build for her could also be Verdant Sound of Destruction to take advantage of the 2 Buster Cards and her Buster Type NP – Golden Wild Hunt. Voyager of the Sea A 1 7 Increases party’s NP damage for 1 turn. Increases party’s attack for 1 turn. Golden Rule B 3 8 Increases own NP generation rate for 3 turns. Pioneer of the Stars EX 3 8 Charges own NP gauge. Own attacks will ignore invincibility for 3 turns. Francis Drake, a privateer, commander, and an adventurer, became famous in the eyes of England. Because of her accomplishments as navigator, she opened the Age of Discovery to England. Because of her expedition, Francis Drake became the supreme ruler of the Age of Discovery. She circumvented the world. In doing so, opened new trade routes for England and helped in their trade. Her achievements helped England keep up. Her discoveries and ruling of the sea brought down Spain, earning her title – “the woman who brought down the sun”. Personality-wise, she doesn’t differentiate people. She treats everyone equally as if they were all the same. However, she is quite flashy. She tends to spend her savings rather than keep it.